Just announced! Amir ElSaffar’s 17-piece Rivers of Sound Orchestra plays at NYC Winter Jazzfest on January 5. See details here. Listen to this feature on Rivers of Sound on WBGO’s The Checkout. Amir ElSaffar tops the Trumpeter and Arranger of the Year, Rising Star categories in Downbeat Magazine’s 2018 Critic’s poll! Check out the Feature Story on ElSaffar by Howard Mandel. “one wondered how so many forms of building music — Western and non-Western scales, alternate tunings, microtonal pitches and what-not — could cohere without producing harsh and ungainly dissonance. Add to this ElSaffar’s solos and accompaniments on santur (a kind of hammered dulcimer), and listeners absorbed more sonic information than one might have thought the ear was capable of processing. 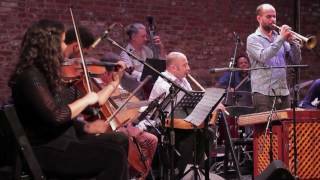 Rivers of Sound is a large ensemble of instrumentalists from Western and Middle Eastern traditions, exploring the confluences of a musical language that transcends notions of tradition and style. 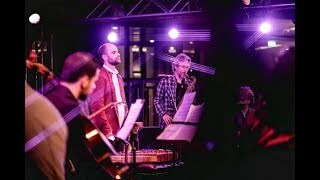 In performing Not Two, an original composition by Amir ElSaffar, each musician interacts with the group through both improvised and composed material to create a novel composite sound. ★ ★ ★ ★ “Rivers of Sound flows in a flux of ever-shifting colors, with bold brass fanfares giving way to classically Middle Eastern sounding strings and sinuous reed melodies evolving patiently over unhurried, swinging rhythms that are accented by the dieting tonality of frame drum and dumbek…with Not Two [ElSaffar] has moved beyond building bridges; his music has become the river.” – Bill Meyer, Downbeat Magazine. “a towering statement of purpose—wise to many traditions, even while it remains accessible to anyone” – Seth Colter Walls, Pitchfork Magazine. – The National, Abu Dhabi. For information on the Rivers of Sound Orchestra, please click here. Check out a full list of Amir ElSaffar’s tour dates here.